UNEDITED Extra Photos - 2012 Mooloolaba Triathlon Festival. 23 to 25 March, Sunshine Coast, Queensland, Australia. Unedited Photos by Des Thureson - disci.smugmug.com. This gallery will contain additional UNEDITED images from the: 1. ASICS Twilight 5km Run, 2. Mooloolaba Ocean Swim, 3. Men's ITU Triathlon World Cup, and 4. Women's ITU Triathlon World Cup. 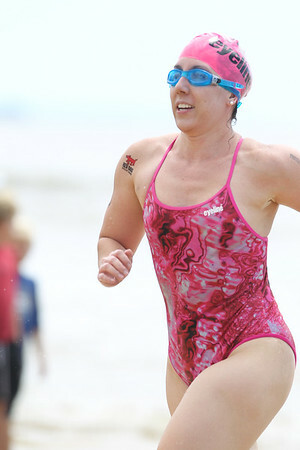 Other additional unedited images are in separate galleries as follows: Superkidz Triathlon here: http://smu.gs/GULyi0; Mooloolaba Triathlon (1396 photos) here: http://smu.gs/GSJ3MY. The images in this gallery have not been edited / cropped. If you order a print, these images will be edited / corrected / cropped before being printed. (If you wish to purchase a download, you can either: 1. Purchase the image 'as is', or 2. Email me and ask me to edit the image prior to your purchase.) Des. 2012 Mooloolaba Ocean Swim; Mooloolaba, Sunshine Coast, Queensland, Australia; 24 March 2012. Photos by Des Thureson - http://disci.smugmug.com. Unedited, uncropped images - If you order a print, these images will be edited / corrected / cropped before being printed. Des.